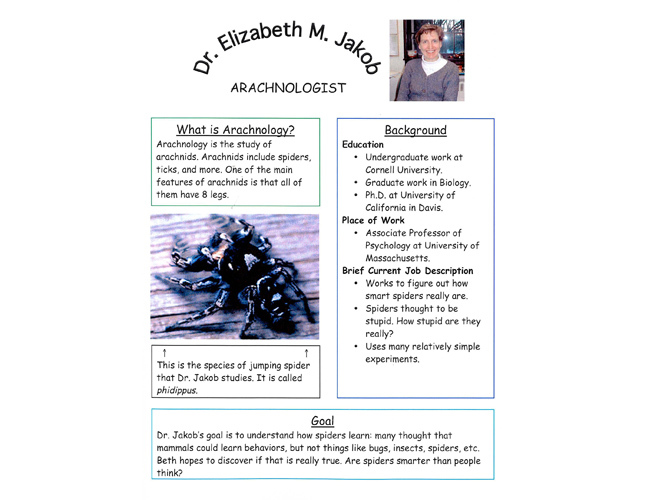 5th/6th grade students from the Shutesbury Elementary School, in Shutesbury, Massachusetts created these profiles as part of a Learning expedition on local scientists. As part of the expedition, students were engaged in a survey-style study of all of the fields that are considered the hard sciences. 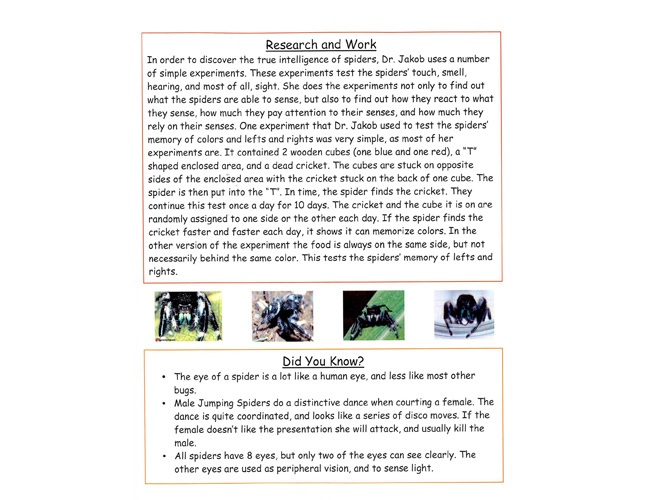 After this overview, each student chose one scientific area that particularly interested him or her. The teacher assembled a list of 50 local scientists whom he had contacted, all of whom expressed willingness to host a young student intern. 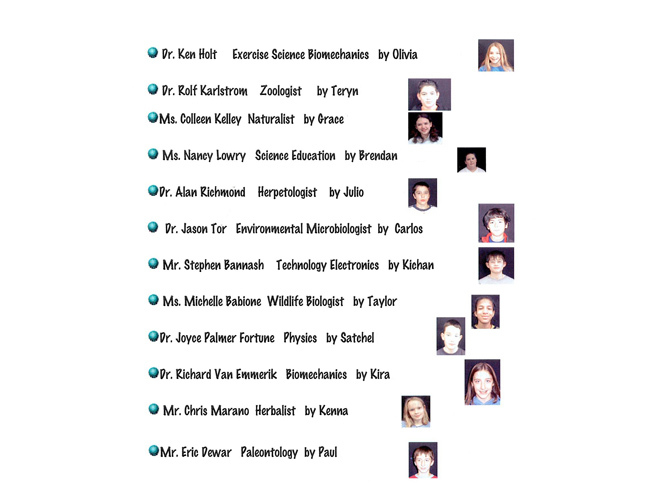 Students chose a scientist from this list based on their field of study, and wrote a formal letter of request for a brief internship at their place of research. Students then did a short internship (mostly one day, or a good part of a day; in some cases multiple days) with a local scientist during which they assisted with real research and documented their learning. All student interns were accompanied by a fellow student for support, who acted as a documentarian for the experience. Transportation and chaperoning of the internships was done by parents (though not necessarily the parents of the student intern; because not all parents were free to support this work, certain parents chaperoned multiple visits). 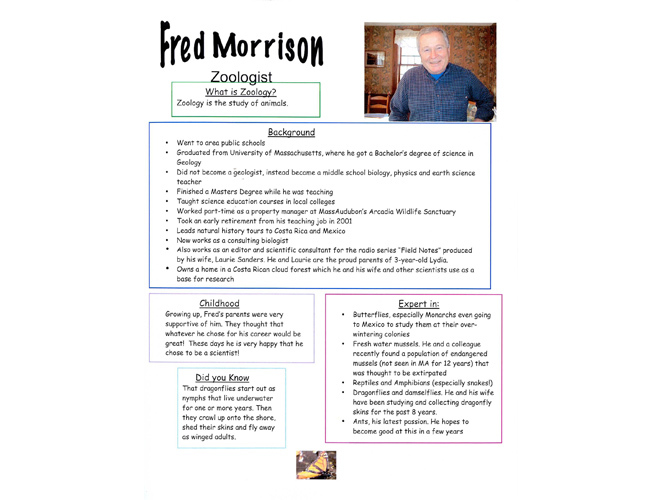 Upon their return, each student created a short PowerPoint presentation in which they shared their experience with their classmates, explaining the general field of study and the particular area of research of their mentor scientist. 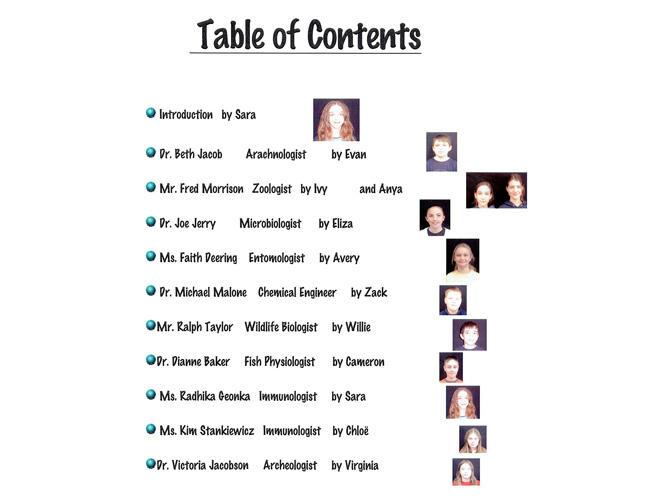 This internship resulted in two products beyond the class presentation: This book titled “Meet Local Scientists”, and a Character File - a life study of a fictional scientist depicted with accuracy. 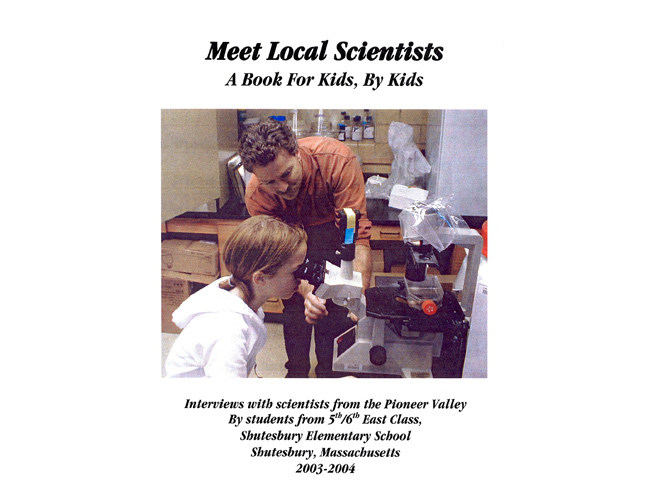 The idea for the book Meet Local Scientists was to create an engaging book for young readers celebrating the work of local scientists and motivating young students to aspire to careers in science. The intent was to produce many copies of the book and donate them to area schools. 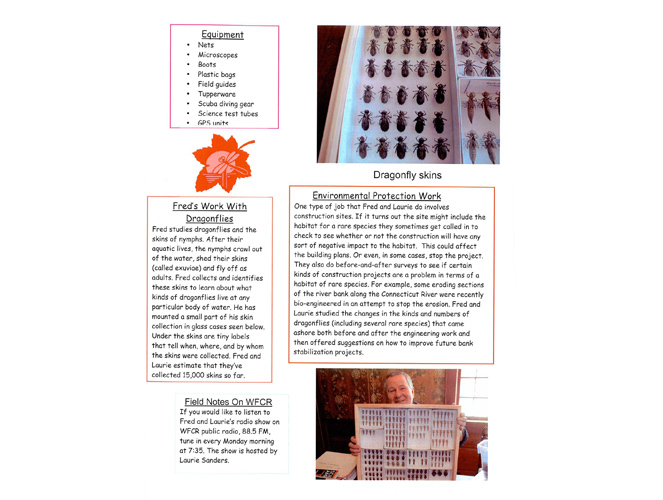 Based on what they learned from their scientists, whose research was primarily funded by grant money, students got the idea to write a grant to a local educational foundation, as a way to secure funds for producing copies of Meet Local Scientists to give to local schools. They searched online and found a local foundation. The class then chose two grant writers; these two students wrote proposal drafts with guidance and critique from the class. After a painfully long wait (three months), the students were informed that they received the grant. They were the only grant recipients that were not teachers or administrators. They were invited to give an acceptance speech at an awards event at Amherst College and subsequently were on the front page of the local paper receiving their award. Students ran all aspects of the production, negotiating together common standards for graphic presentation of their individual entries, retaining some latitude for personal expression and balance of text to photos within a common look. 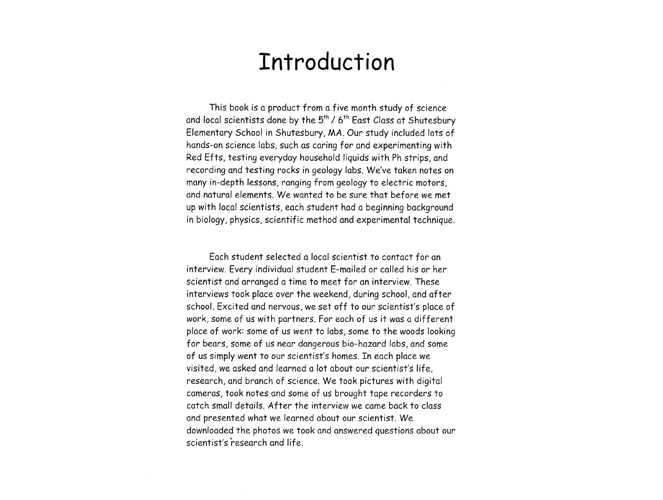 With the funds, students produced 100 copies of their book (printed on an in-school laser printer; bound at a copy center) and distributed it to local schools as a way to encourage younger students to become excited about science in general and local scientists in particular. I can accurately use 5th grade academic vocabulary to express my ideas.